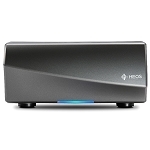 Denon Heos is a direct competitor to the Sonos Multi Room Audio system. The Heos range includes a wide variety of products from freestanding speakers to a rackmount 4 zone amplifier. Freestanding speakers include the Heos 1, Heos 3, Heos 5 and Heos 7. There is also a soundbar which includes a wireless subwoofer called the Heos Home Cinema and a range of amplified products including the Heos Amp, Heos Link Pre Amplifier and the Heos Drive.